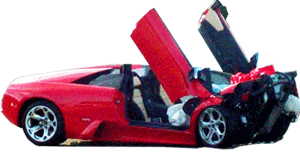 Over the past 10 years, Wrecked Exotics has documented over 10,000 accidents involving exotic cars world-wide. With all of this data on our hands, we wanted to see which cities produced the most accidents. Some that made the top 10 were a surprise - is it because they have terrible drivers or simply a concentration of exotic car owners? - you decide. The winner for worst exotic car drivers in the world: Los Angeles, CA - with 152 documented crashes in the past decade - almost twice as many as the next closest city. The L.A. area has a large number of exotic car owners and the layout of the city requires a lot of driving. Couple that with congested traffic, road rage, and lots of partying - it's no surprise why so many exotics have been wrecked here. Dubai, the land of outrageous architecture and flashy supercars came in 2nd place, with 80 documented crashes. Exotic car owners here tend to be young, rich, and addicted to speed. Many of the accidents involved super-exotics, including two Ferrari Enzos and more than 7 Lamborghini Murcielagos. Miami has the 3rd worst record for exotic car drivers, totalling 77 accidents - almost on par with Dubai's 80. The impressive thing is that Miami's population is less than 500,000 whereas both Dubai and Los Angeles have millions. This city is all about showing off your wealth, which explains the insane number of exotics cruising around. When the "bling" you're trying to show off comes with a 600 HP engine, things don't usually end up well. At 634 square miles, the City of Houston could contain the cities of New York, Washington, Boston, San Francisco, Seattle, Minneapolis and Miami combined. Throw in Texas oil wealth into the mix, and it's no surprise that this city of 2.2 million people came in 4th place when it comes to worst exotic drivers, with 75 documented crashes. The Dallas area has nearly 7 million residents, and like it's cousin Houston, a lot of exotic car owners that need driving lessons. Dallas had a total of 59 documented exotic crashes. Atlanta may be the largest city in Georgia, but it only has about 500,000 residents, so it's surprising Atlanta ranked #6 for worst exotic drivers in the world, with 56 total crashes. Maybe they've been eating too many fermented peaches. Russia is known for crazy road antics, vodka, and billionaires - so it's no surprise they made the top 10. This city of 10 million inhabitants managed to crash 50 exotic cars over the past decade. Hong Kong has the most skyscrapers in the world - it actually puts New York City to shame. But with lots of buildings and congestion, it's hard to drive an exotic car fast. That's probably why this wealthy city of 9 million only came in 8th place for worst drivers. But the 48 crashes that did happen include some of the worlds most expensive supercars, including not one but TWO Pagani Zondas destroyed. OK, Long Island isn't really a city, but this area which is home to around 7 million people has more exotic crashes than its bigger neighbor, New York City. The reason is probably due to the Long Island Expressway, a dangerous stretch of road where people drive like bats out of hell. Most of the accidents have occurred here - 46 total. With a population of nearly 5 million residents, Sydney is Australia's largest city. It's also one of the most expensive cities in the world, which explains the number of people that have crashed an exotic in this area - 43 in total.